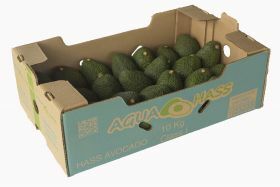 Family-run Hato La Macana is one of a growing group of Colombian avocado producers who have decided to move into direct exports. The company was set up as a coffee producer in 2010 before introducing Hass avocados to its line-up two years later. It carried out its first shipments in 2016 after having made contact with European importers at Fruit Logistica and although still in its infancy, commercial director Juliana Florez says the results of the programme have so far been very encouraging – so much so that major investments are planned for the coming year. In 2017 the company plans to double the number of trees it has planted from 14,000 to 30,000, spread across its two farms in Armenia and Pijao. It has also invested in irrigation system at one of its farms, something few Colombian producers even contemplate. One of Colombia’s key advantages, says Florez, is its production season. There are two main cropping periods, one between September and November and the other from February to April. This provides a relatively clear window between the end of the Peruvian deal and the start of the Chilean season. For Florez, the past year has been a steep learning curve for the company and one that is set to continue into 2017 as it seeks to improve quality and adapt to the demands of the export market. “We recently started practising precision agriculture, treating each tree individually in order to accurately calculate its yield potential and improve cultivation methods,” she explains.